Slazenger HC has changed dramatically over the years from its roots as a works side linked with the Slazenger Sports Company, Horbury Bridge, Wakefield. We have grown over the years to now include 5 Men’s and 4 Ladies teams, and a very active Junior Section. It is now a successful Hockey Club, based at the independent Slazenger Sports and Social Club, welcoming players of all ages and abilities. Slazenger Hockey Club is continuing to go through a strong period of good results, growing engagement and greater development. The club has grown to 5th mens teams and 4 ladies team; and with a junior section of over 150 players, this makes the club the largest it’s ever been. Indeed, it has come a long way since its foundation in the late 1940’s. During World War 2, Slazenger was one of several sports companies to pool their collective resources in order to manufacture equipment for the war effort. When the other factories were damaged during the blitz, the whole consolidated effort was moved to the Horbury Bridge Albion Mills in 1941. After this move, the workers began looking for a new facility for sports and social needs of the workforce. It was in 1948, when land which was previously the site of Horbury Fever Isolation Hospital, was purchased from Horbury Council. In 1950, the site was officially opened, complete with clubhouse, cricket pavilion, red shale tennis courts and grass pitches for football, cricket, hockey and crown green bowls. An indication of the prominence of the Slazenger brand at that time was the grand opening of the grounds, where an exhibition tennis match was staged between Fred Perry and Dan Maskell! It was here, that the Slazenger Hockey Club has its foundations, complete with crest, playing colours (green, blue and white) and its reputation as a friendly and sociable hockey team. Early matches were against local opposition and other factory work’s sides such as Pilkington’s Glass and ICI Chemicals. However, the list of friendly fixtures gradually grew to cover the whole of Yorkshire and then when the Yorkshire Hockey Association introduced league hockey in the late 1970s the teams began to compete across the whole of Yorkshire and Lincolnshire. During this time Slazenger produced its first national player; Eric Walker, the Slazenger goal keeper who went on to represent Yorkshire, North and English national team! From its humble beginnings, the club has continued to grow, develop and expand; long outlasting most all other factory works teams against which they originally competed. By the 1980’s, the club had grown from its original 1 men’s, ladies and mixed team, to 5 men’s teams, 2 ladies and 1 mixed & touring team. It also had developed its facilities; opening a 3rd grass pitch with a star studded game against the Yorkshire Mens first team. The first junior players also started around this time, honing their skills on the grass pitches and training on the floodlight tarmac car park down at the factory! In between this, they even had time to host to Russian National team! However, as a dynamic sport, hockey has continued to change. As synthetic turf pitches (such as Astroturf) became the surface of choice for professionals, the hockey club and Slazenger Sports and Social Club rose to the challenge. By 1995, with a help from the Foundation for Sport and the Arts and Sport England’s Lottery Funding, and many hours of hard work from club members, a state of the art sand based synthetic turf pitch was laid. This is now used by both the hockey club and local football teams and the community who train on it. In the past 17 years, the hockey club has improved its playing strength supported by the development of junior players. The men’s first team now plays in League 1 of the Yorkshire Hockey Association. The Ladies section has continued to develop, with the Ladies 1st’s being promoted out of the Yorkshire Premier League, and into the North Hockey League 2nd Division last season, competing with some of the best teams across the north. There are also Slazenger masters players representing Yorkshire, North and even England! The junior section has grown incredibly. From a few children of senior players, the section has expanded, this year crossing the 100 player boundary, with competing teams in all age groups. This growth continues with the club adding a 5th men’s team and 4th ladie’s team for the 2012-2013 season. The club continues to welcome players of any age, from 6 to 60, regardless of experience not only to participate in this fast, skilful, entertaining, team game but also enjoy the unique club environment. 2013 saw the replacement of the ageing sand based pitch with a state-of-the-art sand dressed synthetic turf pitch. This will update the pitch to the highest quality, providing a fantastic new playing surface and bringing the facilities up to date. In addition to this, the lights have received a total overhaul, meaning evening matches will be brighter and better lit than ever before! A series of working parties have refurbished the changing rooms and the pitch area. The pitch was opened by Rt.Hon.Mary Creagh M.P. for Wakefield, alongside representatives from grant bodies which contributed to the funding of the new pitch. The opening game was a rematch between Horbury and Ossett Academies – following the same game which opened the pitch in 1995. 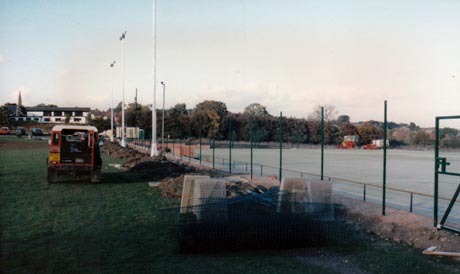 The current pitch has served the Sports Club well for 18 years (since its construction as shown below in 1995). The refurbishment will bring the facilities up to a standard which will rival any hockey facility in the area. Biffa Award is a multi-million pound fund that helps to build communities and transform lives through awarding grants to community and environmental projects across the UK. £52 million to 1579 projects. In the past five years we have awarded over £640,000 to projects in West Yorkshire. For more information, or to find out how to apply for funding, visit our website www.veoliatrust.org. 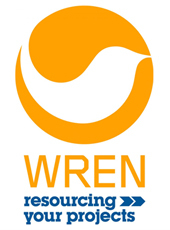 WREN is a not for profit business that awards grants to community, environmental and heritage projects across the UK from funds donated by FCC Environment to the Landfill Communities Fund. principle remit now is to administer the substantial funds resulting from that sale for the benefit of sport in general and hockey in particular.